Ever wonder how the Buffaloes got their name? 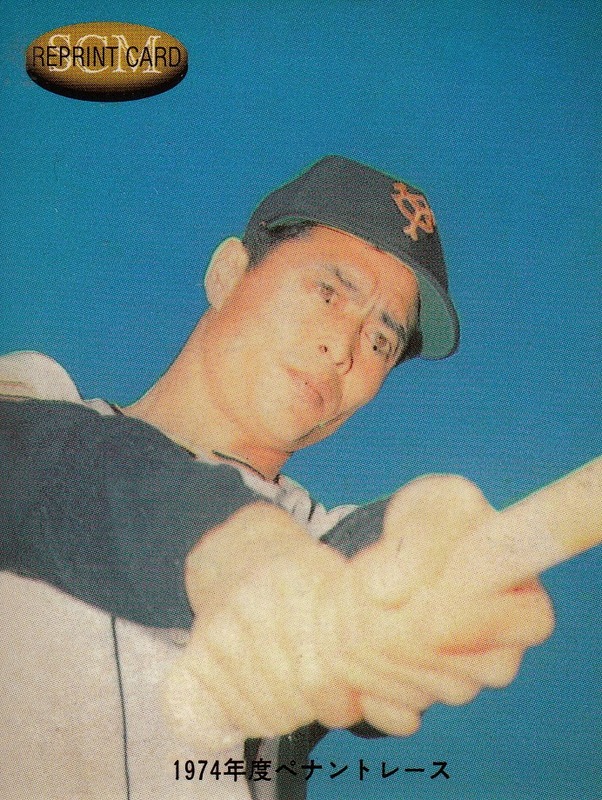 Shigeru Chiba was a star second baseman with the Giants from 1938 to 1956 (except for the years he missed due to the war). His nickname was Mogyu, meaning the "Wild Buffalo" (I've also seen it translated as "Formidable Buffalo"). 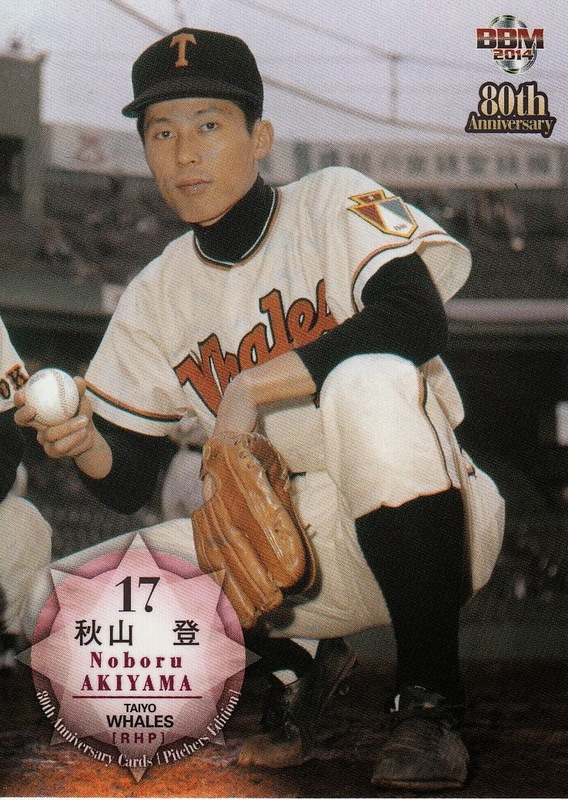 When he took over the Kintetsu Pearls as manager in 1959, there was a fan vote to rename the team. 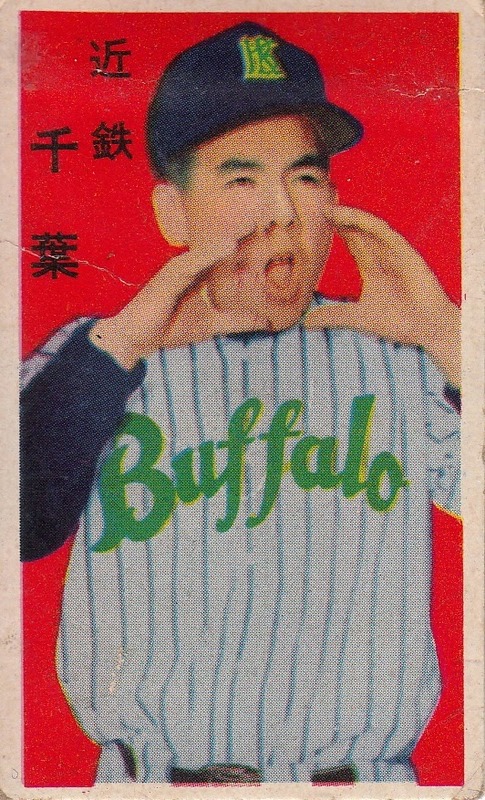 The winning name was inspired by Chiba's nickname and the team was called the Kintetsu Buffalo. And you're reading that correctly, it's the singular. 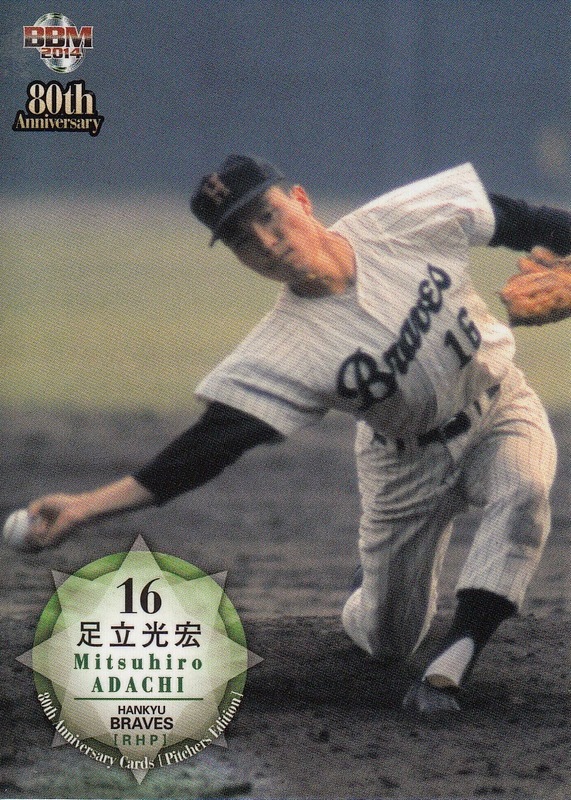 The team changed its name to Kintetsu Buffaloes in 1962 after Chiba was no longer manager. Yahoo! 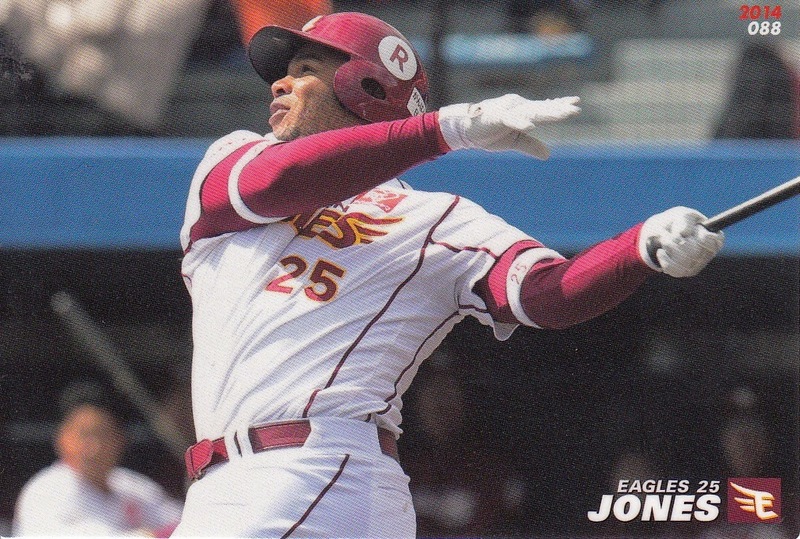 Japan Auctions is a fascinating cornucopia of Japanese baseball cards. It's amazing what all can be found there, sometimes at very reasonable prices. There's just one problem - if you don't live in Japan, it's pretty much impossible to order anything. You have to use a proxy service, which will cause the price of anything you want to grow quite a bit. So what's a proxy service? A proxy service is an outfit that will bid on Yahoo! Japan Auctions for you. They will also handle receiving the item from the seller and shipping the item off to you. Obviously, there is a fee associated with all of this - typically it is driven somehow by the cost of the item. So you end up paying the fee, the price of the item, the cost of shipping the item from the seller to the proxy and the cost of shipping the item from the proxy to you. I believe that there are a number of proxy services out there, but I only have any experience with two of them - kuboTEN and ShoppingMallJapan. I've been using kuboTEN off and on for about four and a half years now. I had stopped using them about a year and half ago because frankly the service was terrible. The guy who runs the site, Craig, was overwhelmed with orders and was also dealing with health issues. Everything I bid on I eventually got but it took months. Last spring I decided to give them another chance - Craig has hired people to help him out and he also rolled out a new website that's a lot easier to use. I've been pretty pleased with the service since then. kuboTEN charges 1000 yen (roughly $10) as their fee plus 10% of the total of the auction win (including shipping to kuboTEN's office in Fukuoka). So if you won something for 100 yen with 100 yen for shipping, you'd pay kuboTEN a total of 1220 yen - 100 yen for the item, 100 yen for shipping, 1000 yen fee and 20 yen for the 10% of the auction total. Keep in mind that you still have to pay for shipping from kuboTEN's office to where ever you are. You can combine items for shipping if you have multiple wins. If you win several auctions from the same seller within a 24 hour period, you only have to pay 100 yen (plus the 10 %) more per auction (rather than 1000 yen per auction). Shopping Mall Japan has apparently been around for quite a while now but I just learned about them last spring. I've done a couple auctions through them and they're OK. Their website is kind of clunky (you can only log in or log out on the main page) and it's sometimes hard to find things. I also feel they are very slow to let you know when things happen. Their fee structure is a little bit better than kuboTEN's depending on what you're ordering. There's a $3 "wire" fee plus a processing charge that varies depending on how much your auction win was. It's $6 for an item less than 2000 yen, $8 for an item between 2001 and 6000 and $1 more every 1000 yen after that up to 33,000 yen. Between 33,000 and 100,000 yen it's a flat fee of $35 and beyond 100,000 it's $0.50 per 1000 yen. If you buy multiple items from one seller, SMJ only charges you the $3 fee once and takes $1 off the processing fee for each item won (so if you won three 1000 items from the same seller, you'd pay the $3 wire fee + $6 for the first item + $5 for the second item + $4 for the third item). One of Shopping Mall Japan's interesting features is that they have an office in Tokyo as well as in Indiana (I think it's in Michigan City but I'm not positive). They bulk ship items via EMS from Tokyo office to the Indiana office so that you only end up spending a fraction of what you would normally. So you ultimately end up paying for shipping three times - seller to SMJ's Tokyo office, SMJ's Tokyo office to SMJ's Indiana office and finally SMJ's Indiana office to you. The hope is that this works out to being cheaper than shipping from Japan directly to you. Both proxy sites require that you pay a deposit before you can bid on anything. This is to protect themselves from deadbeat buyers. It's fairly easy to enter a deposit in kuboTEN - you go to the account management page (after you log in) and click on the "add funds" button in the deposit section. You'll be taken to another page to enter the amount that you want to deposit, then taken to another page to actually make the payment. You can pay either by PayPal or directly by credit card but either way you end up paying a 3.9% fee by their payment processor. Once you pay the deposit, you are allowed to bid up to the amount of your deposit. It's a little more complicated with Shopping Mall Japan. You can pay a cash deposit via PayPal but you need to go to PayPal directly and send the money to SMJ's email along with a note with your user name. You then have to wait until they credit your account with the deposit which could take a little while. Once you have been credited with a cash deposit, you can build to (roughly) five times what your deposit was. You can also do a credit authorization deposit using a credit card - I haven't done this but it appears that you can't do it directly on their website - you need to send them an email telling them how much to authorize. Once a credit deposit is set up you can only bid up to the amount that's authorized. Both proxy services offer ways to search Yahoo! Japan Auctions but I haven't used them much. I generally search the auctions directly and once I find things I want to bid on I use each site's auction bid page. I have to say that SMJ's page is much easier to deal with than kuboTEN's. At SMJ, all I need to do is enter the URL of the page I want to bid on along with the amount I want to bid (you actually enter that on a second page after SMJ has looked at the url). At kuboTEN, I need to enter the name of the auction site (kuboTEN also supports bidding on mbox and Rakuten Auctions), the url, the title of the auction, the auction id and the amount you want to bid. (I asked Craig at kuboTEN why I had to fill all that in - basically he said that if you used kuboTEN to search YJA directly, I'd be able to bid very easily - the page I'm using was really meant for the other auction sites. Since I don't like the lack of flexibility in kuboTEN's auction browser, I'm going to continue to do it this way). Auction, Domestic shipping and fees 686 6.92 Domestic shipping was 100 yen. Fees were 1060 yen (1000 yen plus 10% of 600 yen). Total including auction price was 1660 yen. I paid 1000 of that using the deposit so I needed to pay 660 yen. I had to pay 26 yen PayPal fee on that also. PayPal used an exchange rate of 99.23 yen = $1. International Shipping 229 2.31 kuboTEN gave me three options for shipping - surface(I think), SAL and EMS. Surface was the cheapest but SAL was only about 40 yen more and roughly 1000 yen less than EMS, so I went with SAL for 220. Once again, I had to pay an extra "PayPal fee" of 9 yen. PayPal used an exchange rate of 99.22 yen = $1. So Shopping Mall Japan was almost two dollars more than kuboTEN. 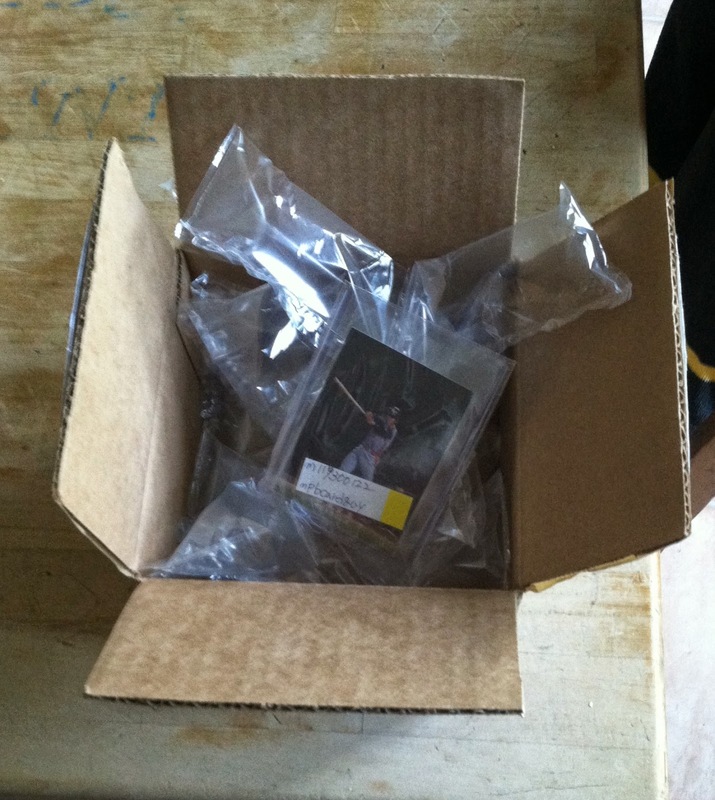 The bulk of the difference appears to be in the shipping costs. They charged me 330 yen for shipping from the seller to their Tokyo office and then from the Tokyo office to Indiana. This seemed somewhat high to me. When I asked them how much the bulk shipping fee was, they said it was only 30 yen, implying that shipping from the seller to the office was 300 yen. I pointed out to them that the auction said that domestic shipping was only 100 yen (which is what kuboTEN paid but I didn't tell them that part). I did not get an answer back from them on that. 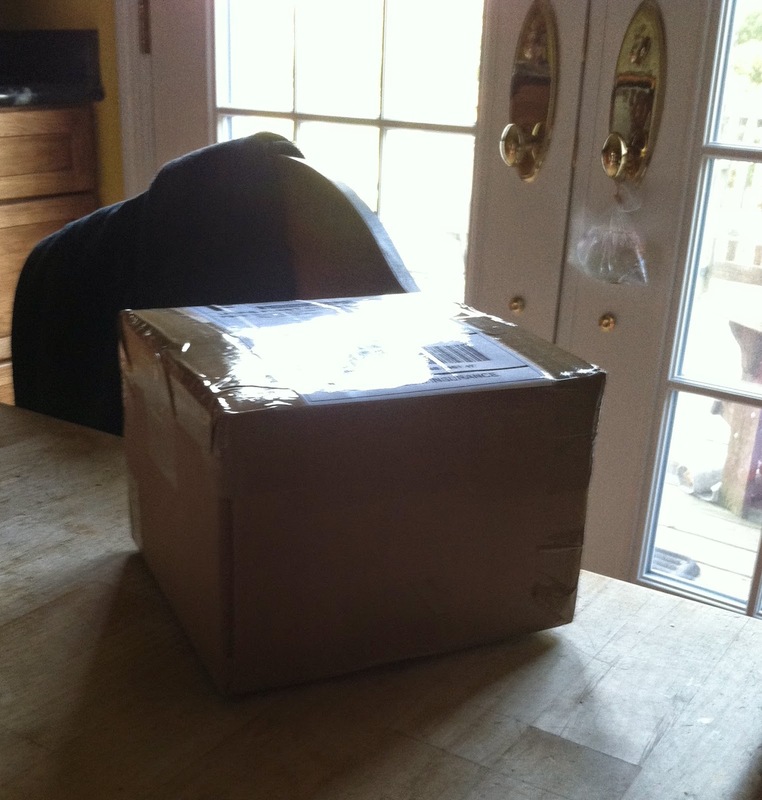 Even more ridiculous, however, was the final shipping from Indiana to my house. I requested first class, expecting that it would be a dollar or so to ship the single card in a padded envelope. Instead, I was charged $4.05 for a box roughly four inches on a side. Once you make your shipping request, SMJ goes ahead and ships your item before you get a chance to argue the price so at that point I had to just pay it. The other thing that SMJ does that I didn't like here is decide what the exchange rate should be. They used an exchange rate of 97 yen = $1 so my auction price and shipping cost of 830 yen was $8.55. If I had gotten the same rate that I had been getting from PayPal (about 99 yen = $1), it would have been about $8.38. Not a huge difference for this particular item but for a more expensive item, this could end costing a couple of dollars. The auctions ended on July 24. I received the card from SMJ on August 6th. I did not receive the card from kuboTEN until August 19th. kuboTEN had shipped the card the morning of July 29th (Japan time) so took almost 3 weeks for the card to get to me which is a little long for most shipments I get of this type. I suspect that for whatever reason, the card got held up in customs. I mentioned before that I would not normally have bought these two cards this way - I would have bought both of them through one site or the other. I thought it might be interesting to see how much I would have paid if I had used each site to buy both cards. We're going to use the same deposits and assume that the shipping costs would have been the same in both cases. For kuboTEN, the auction cost would have been 1100 yen, so the fee would have been 1210 yen (1000 for the first item, 100 for the second and 110 for the 10% of the auction cost). The total would have been 2310 yen. I would have paid 1000 of that using my deposit, so I would have sent a second payment of 1310 which (with a fee of 3.9%) would have been about $13.75 (using an exchange rate of 99 yen = $1). We're assuming shipping would have been the same so for a total we sum up the deposit ($10.53), the second payment ($13.75) and the international shipping ($2.31) and get a total of $26.59. For SMJ, we'd be paying the $3 "wire" fee, $6 for the processing of the first item and $5 for the processing of the second item plus 1330 yen for the items plus the shipping. At their exchange rate of 97 yen = $1, that 1330 yen becomes $13.71. Add in the $4.05 final shipping and we get a total of $31.76. So it would have cost almost $5 more to have used SMJ. So in wrapping this up, I have to say that I think kuboTEN is the better way to go. They end up being a little cheaper and they really seem to have cleared up the issues that I had had with them in the past. Really the only thing that I like about Shopping Mall Japan is the ease of entering a bid. I did get the card faster via SMJ but I think that may have been a fluke. I think kuboTEN's site is much easier to deal with when I need to pay for something. kuboTEN is also much better at sending emails to let you know something has happened, like your item has been received. I have never gotten an email from SMJ telling me my item had been received - I have only discovered it by checking my account page on their site. Most importantly, I have never felt like kuboTEN has done silly things with shipping that ended up costing me more money. I'm going to notify both sites about this post and invite them to respond. I'll publish any emails I get from them here. I noticed last week that Super Star Baseball Card, the Korean outfit who had put out a set of baseball cards a couple months back, have announced and released a second set. The set is labelled "1st Edition" like the earlier set but it is also labelled "Season 2" to differentiate it from the earlier set. The set once again contains 126 cards in the base set. They are numbered 1-126 so they are not numbered in continuation of the previous set. The good news is that it looks like none of the 126 cards are short printed. There are "All Star" parallels of 54 cards (six per team) and some sort of other parallel for 9 cards (1 per team). It looks like this mystery parallel could be one of several different types - a parallel design, a parallel design with facsimile autograph, an authentic autograph and a jersey card. You can see pictures of the cards at Super Star Baseball Card's Facebook page. Jason has already added the cards to the checklists at Sports Card Forum and Trading Card Database. From his analysis, it doesn't appear that anyone who appeared in the earlier set shows up in this set. The set also does not include any foreign players. Jason has pointed out that each Korean team has 66+ players on their roster (I would assume split between the top team and the "minor league" team) so Super Star could potentially put out two more sets without having any overlap in players or having any foreign players. I don't pay enough attention to the KBO to know if the 28 players per team included so far are all top team players or not. The set was apparently released on August 19. Well obviously my hiatus was not quite as long as I thought it would be but there's still going to be a bit of a difference in the posting. My computer is in our family room on the ground floor of our house but most of my cards are in binders in my office in the basement. Messing around with the binders is a bit of a strain currently and bringing one or two upstairs for the blog is probably overdoing it right now. So most of the posts in the next few weeks will probably be heavier on text than pictures of cards. 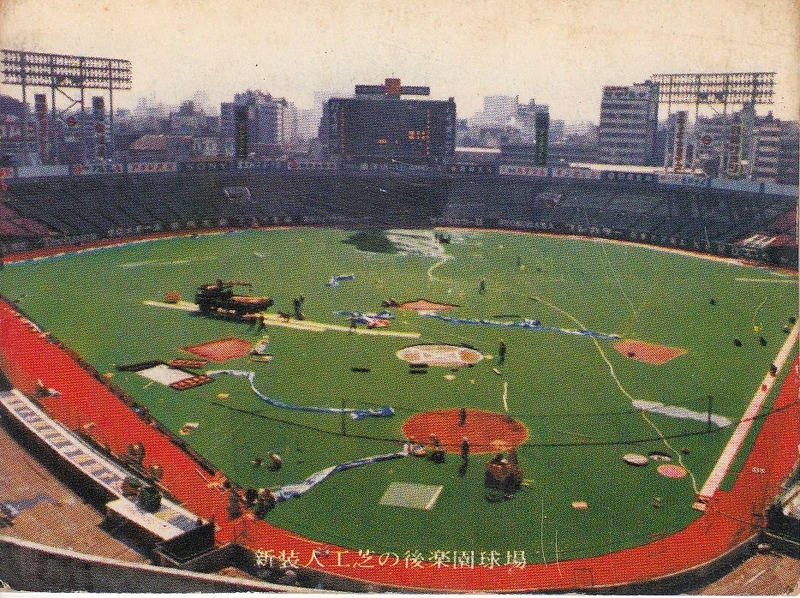 The Card Of The Week this week is another card dealing with the installation of artificial turf at Korakuen Stadium in the 1975-76 off season. I was originally going to use this as Card Of The Week last week as a symbol for my back surgery but doing a post last Sunday was really out of the question. - BBM is doing four more team specific box sets. The first one up is Tigers Fielding, a 24 card set with 23 cards of Tigers players in the field and 1 special card which could be an autograph or jersey card. It will be released at the end of August. BBM will follow that up with the Celebration Of The Hawks set which will have 27 cards of Hawks players in this year's red alternate jerseys plus one special card (photo, facsimile autograph or real autograph). This set will also be released in late August. Mid September will see Red Sensation, a 28 card box set for the Carp. It will have 27 regular cards of Carp players plus one special card which could be a foil parallel, a jersey or bat card or some sort of "large format" card that is four times the size of a normal card. Around the same time, BBM will also be releasing a box set for Orix called something like "March". It will also have 28 cards in the set with 27 being base cards showing Buffaloes players and the other being an autograph or jersey card. - BBM will also be releasing Genesis, their high end set, in mid-September. This is a pack based set with a base set of 120 cards - 9 per team plus a team checklist. There is a mind-numbing array of parallel, insert, autograph and memorabilia cards available in the packs. The memorabilia cards include jersey, ball, and patch cards and I think there might be cards that have autographed baseballs embedded in them. - And if two cheerleader sets this summer wasn't enough for you, BBM will be releasing the unfortunately named "Honeys Flash!!" set in mid-September. This is a 46 card box set dedicated to the Fukuoka Softbank Hawks dance team the Honeys. There are 44 base cards in the set - 21 of the dancers in their costumes, 21 of the dancers in street clothes, one group photo and I'm not sure what the other card is. Each box contains 2 special cards - one is an autograph card (either facsimile or real) and the other is some sort of foil version of a photo card maybe? I'm not sure I'm understanding Google's translation very well. - Series Three from Calbee will be out on September 15. 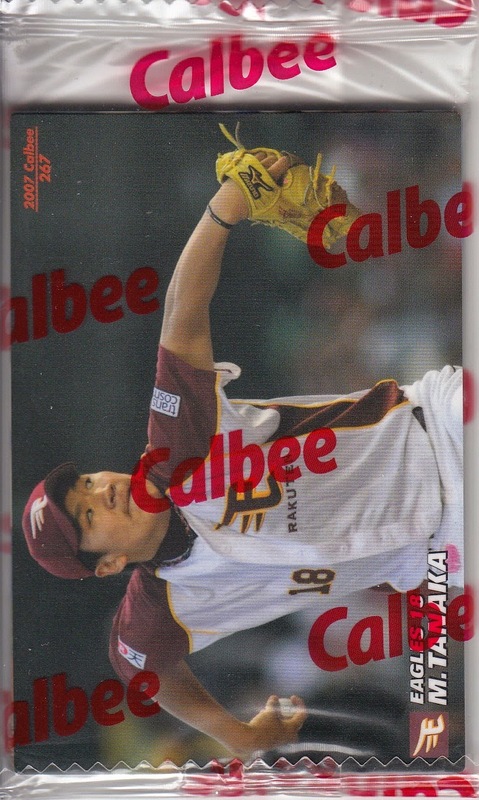 Like the two previous Series from Calbee this year, this Series features 84 player cards, 7 per team. There are also two subsets - a 12 card "Clutch Hitter" (CL) subset featuring a hitter from each team and the ubiquitous four checklist cards. The player cards plus this two subsets make up the 100 card, non-premium portion of the set. The standard 24 card (2 per team) "Star" card insert set is also included. Rounding out the set, there's a 12 card set dedicated to closers that is available (somehow) by mail order plus the two cards that are obtained by redeeming specially inserted "lucky cards" in the packs. I'm assuming that like the two previous sets this year that these will be 3D cards. I think (but I'm not positive) that the two cards are of Yuki Nishi of the Buffaloes and Tomoyuki Sugano of the Giants. I'm doing a bit better than I was last weekend so I thought I'd make an attempt to post something about a project I've been working on for a couple months or so. Since I started picking up the new issues of Sports Card Magazine when they come out I've been getting more and more curious about the cards that BBM prints up solely for use in the magazine. So I started doing some research with the goal to generate a list (in English) of all the SCM insert cards. You may be telling yourself "That's not a big deal. Every issue of SCM includes a list of all the SCM cards so far". Which is true, but there's several caveats. The first being that the list is in Japanese, not English. The second is that there's not much information about the card other than the name of the player(s) depicted on the card. The third is that there are no card numbers associated with any of the cards listed in the SCM even though almost all the cards I had seen had card numbers. The final caveat was something I didn't discover until I was halfway through my research - the list in SCM is not complete. I found at least one instance of there being a card that was obviously from SCM not being in the magazine's list. So, lots of work to do. The magazine that we now know as Sports Card Magazine started out as a small magazine (or pamphlet) in the early 1990's that was mostly given away at card shows. Paul Margiott, one of the pioneers of the hobby, told me that they were "glossy paper, center stapled, color covers, professionally printed." They contained "ads, articles, price guides, ‘World Card News’, etc;" The final issue appears to have been #14, issued with a cover date of "Winter 1996". This issue had 48 pages. (The quotes from Paul Margiott came from an email conversation he and I had a few months back. I apologize ahead of time if I misunderstood something he wrote me). *Just want to stress that the dates I'm using for the newsstand version are the actual publication dates of the magazine (i.e. the date they hit the newsstand) rather than the cover data of the magazine. BBM has included cards inserted in every issue of the magazine starting with issue #1. I have not been able to figure out who the cards with issue #1 were. 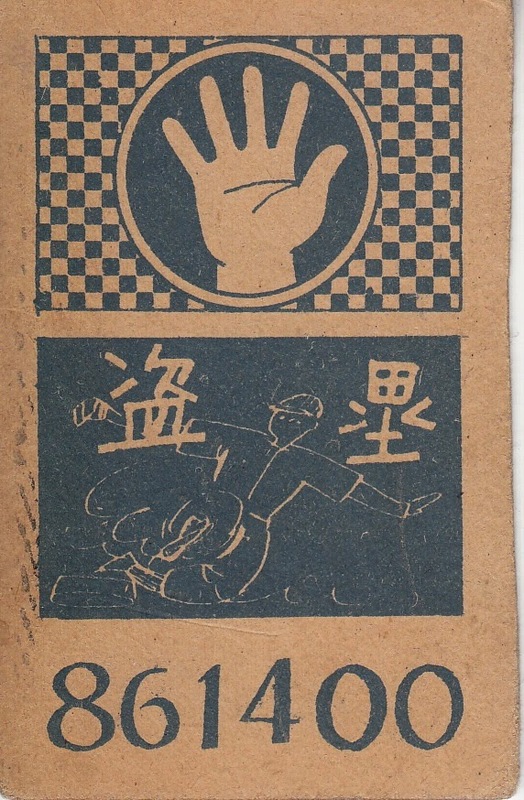 Many of the insert cards during the first few years were not baseball related - many were related to wrestling, sumo and boxing, as well as I think at least one race horse. And before you ask - this is not the first card included in SCM that was not a promo version of another card. There were at least two others prior to this. Back to being unnumbered. It looks like SCM would skip number the insert cards for the next nine years or so - the last cards that I know for sure were unnumbered were included with issue #68 in March of 2008. I can't swear to this, but I believe that for a certain period of time, SCM would not number cards that were promos for memorabilia cards (the dreaded "non-memorabilia" cards). But as far as I can tell, every card included since March of 2008 (which includes promos for memorabilia cards) have been numbered. I've lumped all the cards into five categories - Original (meaning there's no set that the card is related to - at least not one from when the card was issued), Reprint (reprint of an earlier card), Promo (promo version of a card from a set that is indistinguishable from its original except by text saying it's a promo and/or a color variation in the graphics), Variant (a promo version of a card that differs in picture and/or additional graphics) and Bonus (an original card done in the format of a recent set). As you can see, the photos are identical - the only difference is in the color of the graphics (and the inclusion of the SCM logos). 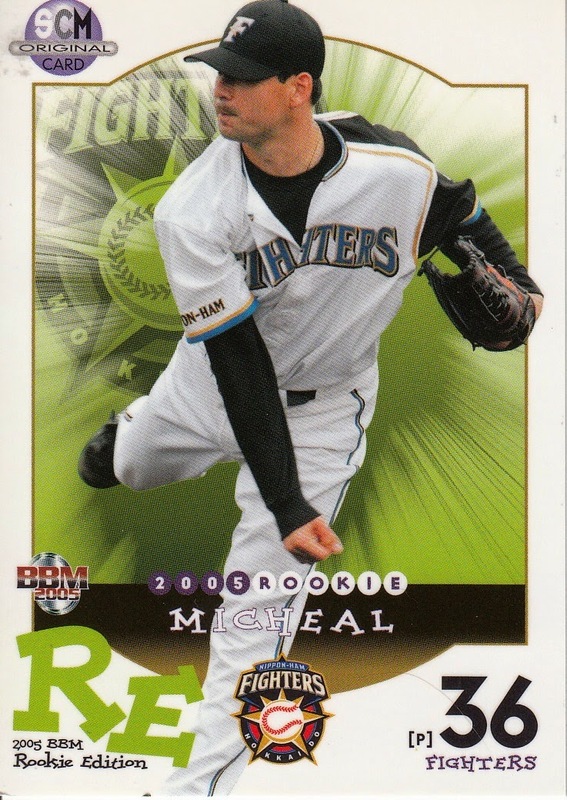 This Michael Nakamura card is a Bonus card for the 2005 BBM Rookie Edition set - it is numbered #120 while the original set ended at #119. There's a lot of interesting cards that BBM has included with SCM. Many highlight events or awards that BBM has not done anything with in their flagship sets. There is what I felt a surprising number of bonus cards for the 2007 1st Version set and a couple of the Rookie Edition sets. There are some interesting inserts like the one with issue #81 in May of 2010 - they are cards of rookies done in the style of the 1991 BBM flagship set - basically Classic before BBM officially did Classic in 2013. I've put a link to my checklist here so that any updates I make to it will immediately become visible to anyone looking at it. I'm going to be going on a brief hiatus for a couple weeks. I had back surgery done on Wednesday and I suspect that attempting to continue the blog during recovery is going to be difficult. I'll try to still respond to comments and questions although I won't guarantee that I'll do it in a timely manner. Hopefully I'll be back blogging by the middle of September. Take care and I'll see you then. * Just to be clear, Nippon Professional Baseball as an organization has not been around since 1935. Professional baseball in Japan was called the Japan Baseball League from 1935 until 1949. 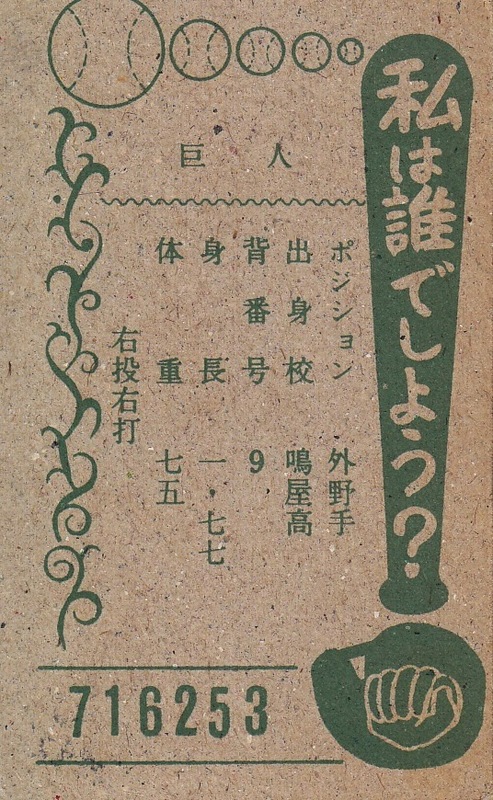 The reorganization into the two league system resulted in the creation of NPB. 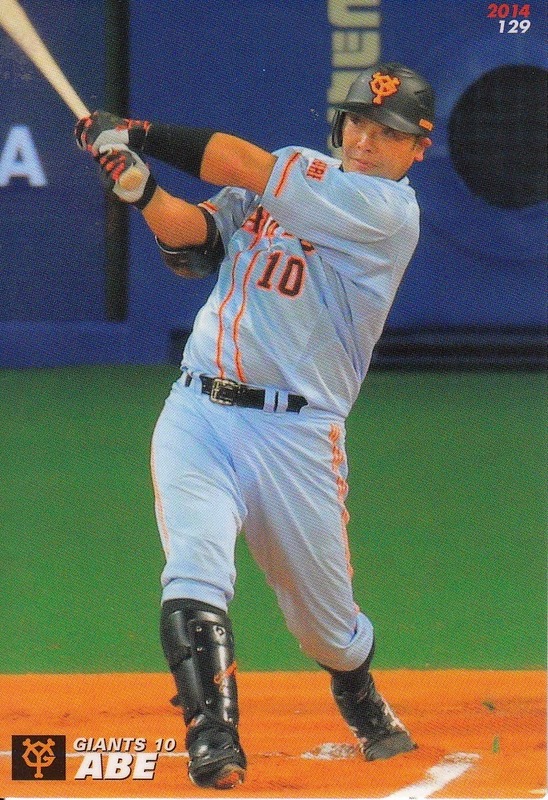 The Giants 70th Anniversary set was the first set BBM ever released that was a team specific OB set. 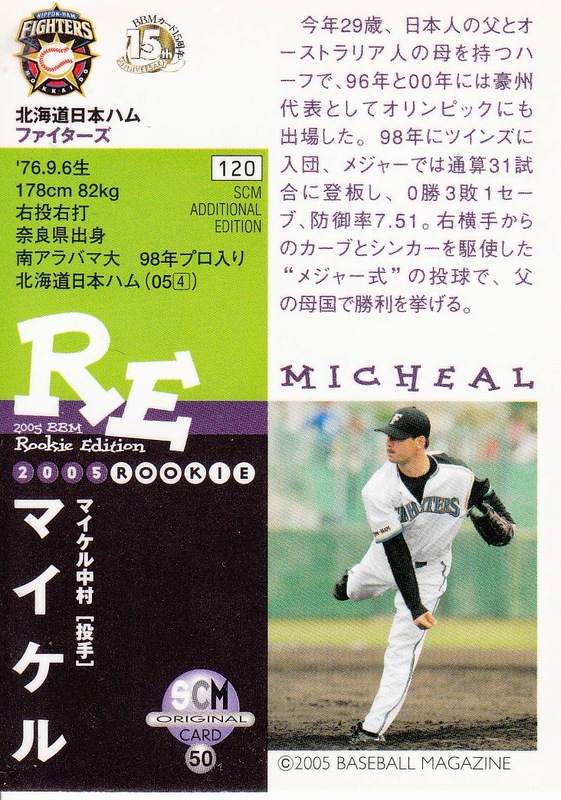 BBM had done team specific sets before that included OB players (the 1999 Seibu Lions team set celebrating their 20th year in Tokorozawa is one example) but this was the first set that featured many more OB players than current players. The pack based set pretty much established the pattern for many of the OB team sets that would come later. 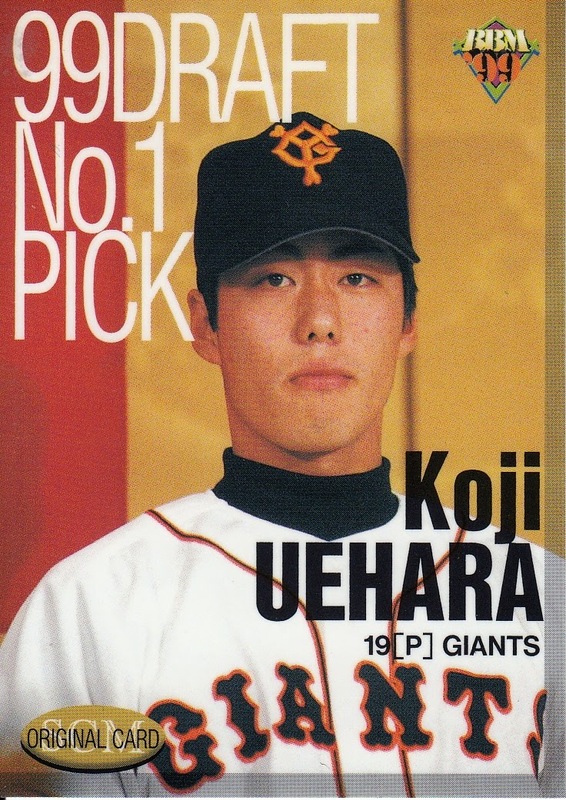 There was a six card "History Of The Giants" subset, a large subset (75 cards in this case) featuring OB players for the Giants which included players who were still active at the time in both NPB and MLB, and a smaller subset (28 cards in this set) featuring the current year's team. This particular set was 104 cards, the largest of any of the OB team sets. Most would be 99 cards with some of the more recent sets dropping to 90 or even as low as 81 cards. BBM followed up the Giants set with 70th Anniversary sets for the Tigers (in 2005) and Dragons (in 2006). 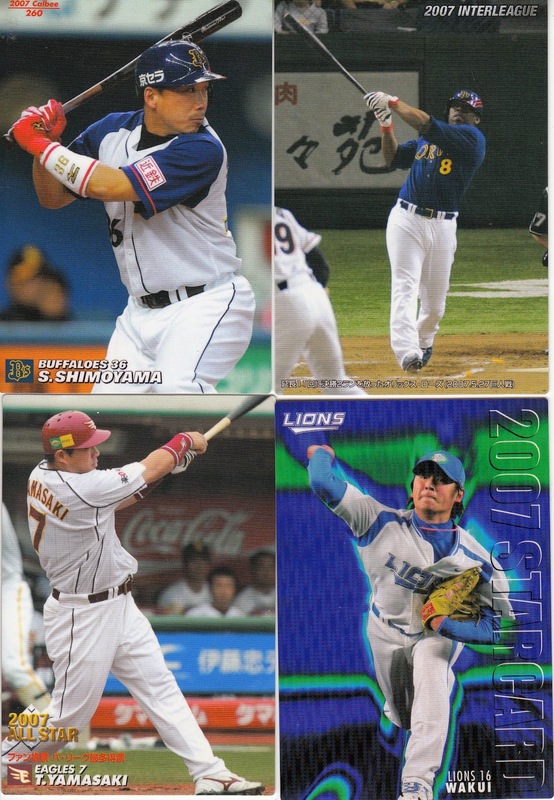 In 2008, they really got going - pumping out sets to celebrate the 70th Anniversary of the Hawks, the 40th Anniversary of the acquisition of the Orions by Lotte, the 30th Anniversary of the Lions being acquired by Seibu and the 30th Anniversary of the Whales (now Baystars) moving to Yokohama. 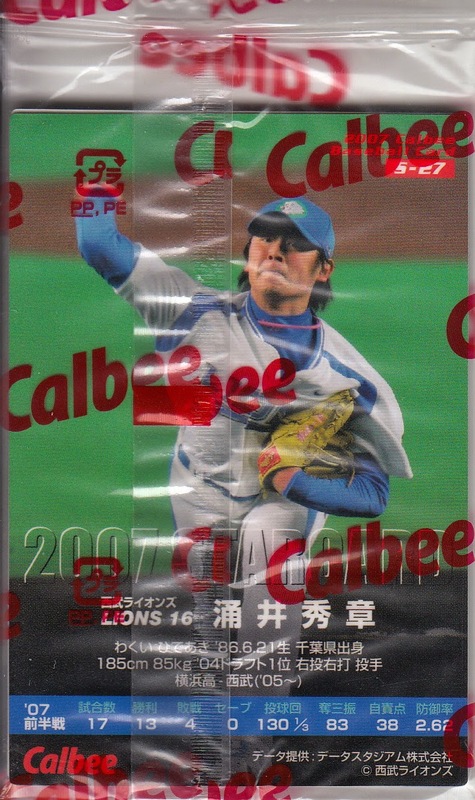 In addition to those pack based sets, BBM also issued box sets celebrating the Lions' 29 years in Fukuoka and the closing of Hiroshima Municipal Stadium. 2009 saw another six OB team sets. The 60th Anniversary of the two league system brought 60th Anniversary sets for both the Lions and the Carp as well as a Kintetsu Memorial set (BBM had done a small box set in 2004 to commemorate Kintetsu leaving professional baseball but that was a more traditional BBM team set with only a relative few OB players). 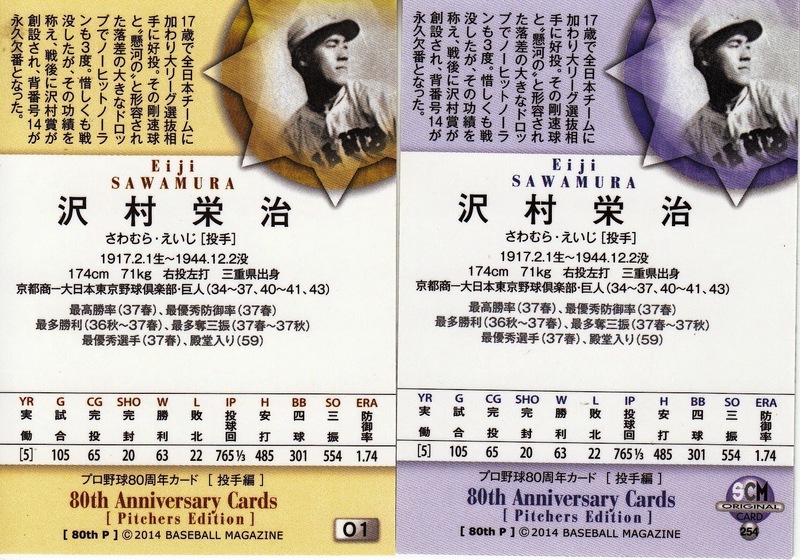 Another set celebrated the 40th Anniversary of the Swallows by Yakult. The 20th Anniversary of Orix buying the Braves from Hankyu was commemorated by a pair of box sets - one was dedicated to Hakyu players before the sale of the team and the other was for the Orix era. Somewhat significantly, 2009 did NOT see a 75th Anniversary set for the Giants. BBM dialed things back a bit for 2010 and 2011. They only issued two OB team sets in 2010. Five years after the Tigers had celebrated their 70th Anniversary, BBM was back with a 75th Anniversary set. And for the first time, BBM issued an OB team set that was not tied to an Anniversary (or an event like the closing of a stadium) - the Lions Classic set that showcased the throw back uniforms that the Lions had worn in recent seasons. The set contained both active players wearing the throw back uniforms and OB players wearing the original uniforms. BBM did three more sets in 2011, only two of which were actual Anniversary sets - the Dragons 75th and the Marines 20th year in Chiba. 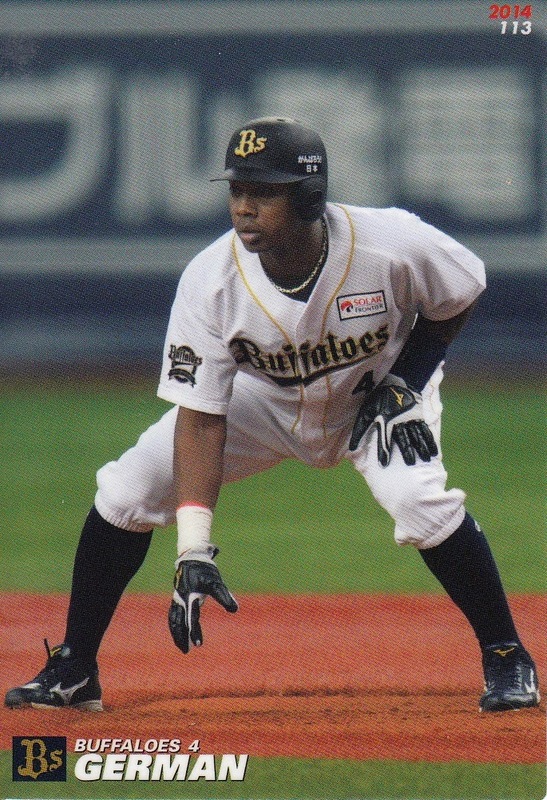 The other set was a tie-in to a promotion that the Orix Buffaloes were doing that commemorated the 1970's era Kintetsu Buffaloes and Hankyu Braves. After no OB team sets in 2012 (for the first time since 2007), BBM brought them back with a vengeance in 2013. Three were "traditional" Anniversary sets - the Hawks 75th, the Baystars 20th of having the name and the Fighters 10th of being in Hokkaido. They also did a small box set featuring the three Nippon Series championships that the Hawks had won during their 25 years in Fukuoka. Lastly, BBM started a new series of OB team sets called Legend. 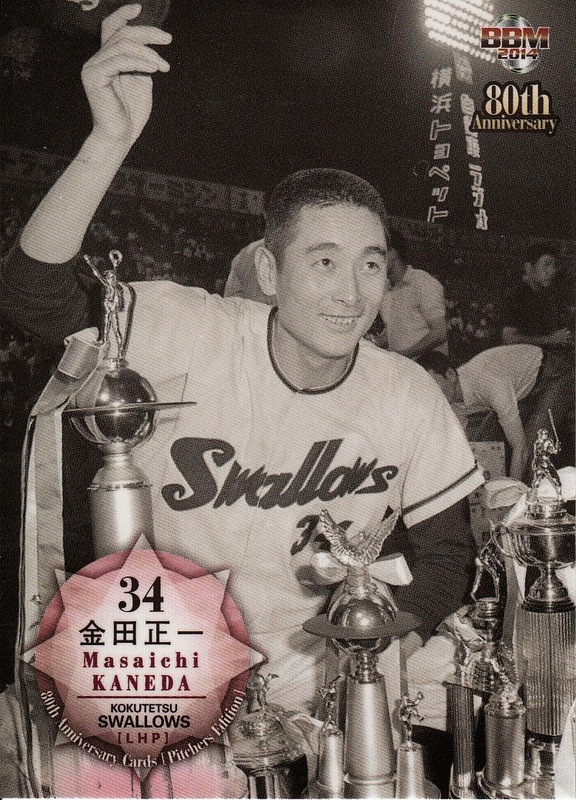 The first one was for the Giants and commemorated the two stints Shigeo Nagashima had managing the team (1975-1980, 1993-2001). The second highlighted the Tigers in the 1980's (when they won their sole Nippon Series championship). 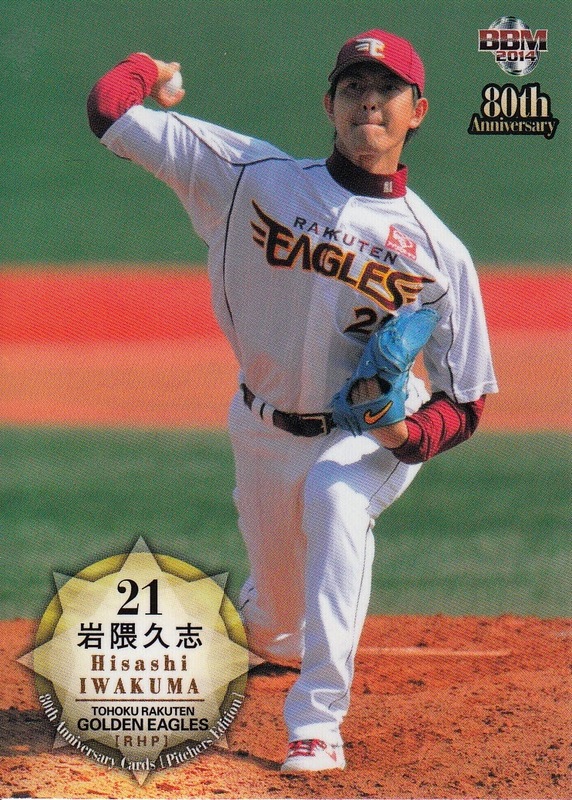 So far 2014 has seen three OB team sets - the latest Legend set that commemorates the Senichi Hoshino era with the Dragons (1987 to 2001 although he didn't manage them that entire stretch) and Anniversary sets for the Eagles (10th) and Orix (25th). I'm anticipating that there will be a Giants 80th Anniversary set before the end of the year but that remains to be seen. As you can see from this list, all 12 NPB teams have had at least one OB team set done. The coverage of a team's history, however, varies greatly from team to team. While most teams have coverage for their entire history (in theory anyway), for teams are missing large chunks of their history. The Marines, the Swallows and the Whales all were founded in 1950 but their coverage in the OB teams sets starts in 1969, 1970 and 1978 respectively. The Fighters have been around nearly 70 years (they started life as the Senators in 1946) but their history prior to 2004 has been ignored. I'd love to see BBM rectify this for these four teams but I'm not really expecting it to ever happen. 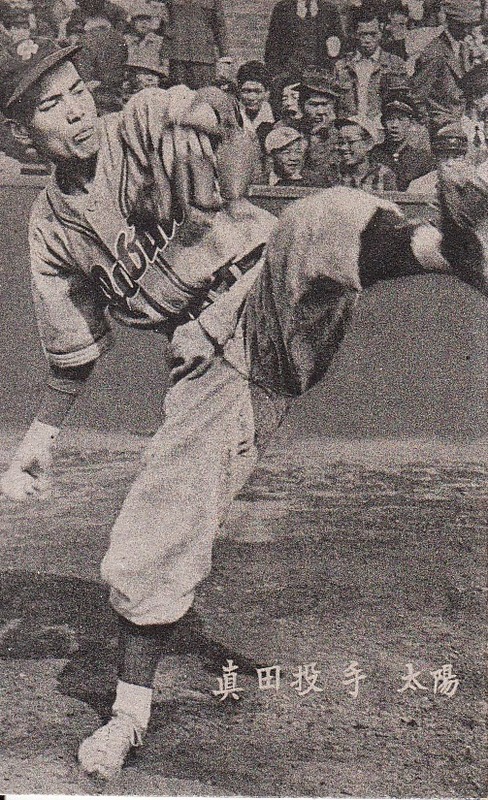 Juzo Sanada was a star pitcher for the Taiyo Robins (aka Pacific in 1946 and the Shochiku Robins in 1950-51) in the years immediately following the war (during which he served in the Navy). 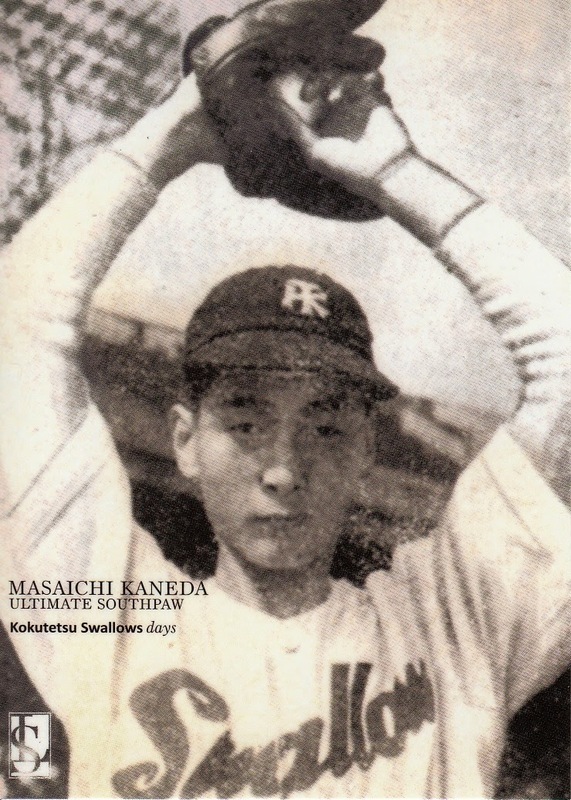 He threw two no-hitters and won a Central League record 39 games in 1950, leading the Robins to the inaugural Nippon Series (that they lost to the Mainichi Orions). He was elected to the Hall Of Fame in 1990, a couple of years before he passed away. One of the things I really like about this card (other than showing off Sanada's leg kick) is the faces in the crowd behind him. There's what looks like a couple kids in the front row enjoying themselves and a couple guys behind them that look kind of bored - the one guy is resting his head on his hand and the other appears to be yawning. In late 2008 through 2009, BBM issued a series of three biographical box sets they called the "Legend Series". 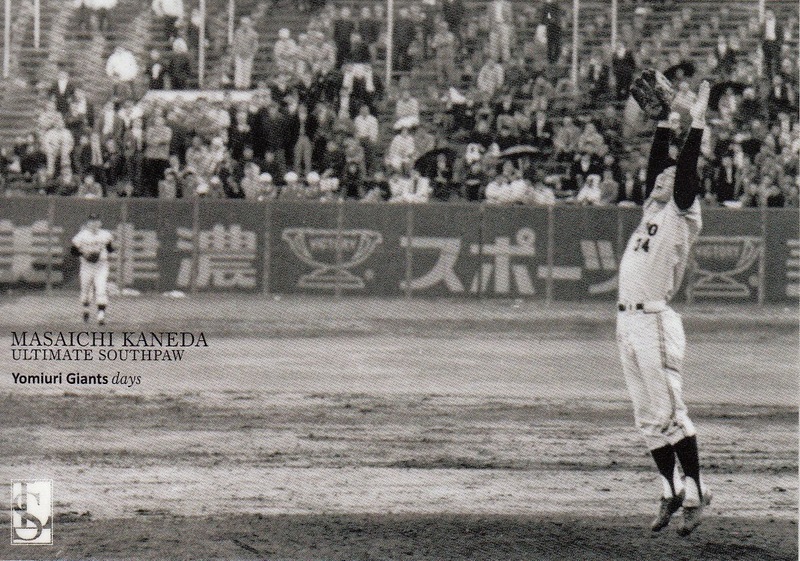 The first two were for two greats who had retired at the end of the 2008 season - Sadaharu Oh and Kazuhiro Kiyohara. 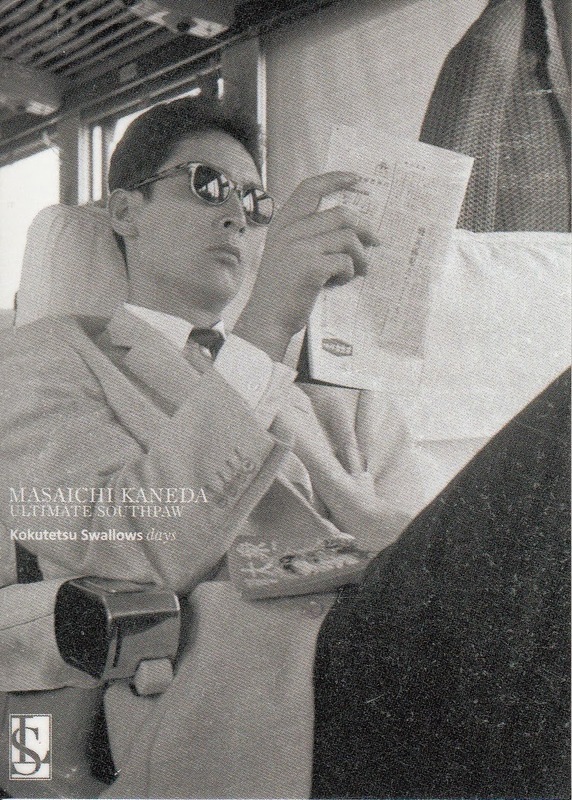 The third (and final) set was for Masaichi Kaneda. I'd been back-and-forth about getting this set for years but I finally decided to pick it up earlier this year. I'm glad I did as it's a nice set. I have to say though that I have no idea why BBM decided to do a Kaneda set in 2009 and, given that Kaneda rarely appears in an OB set, I have no idea why Kaneda agreed to do it (well, other than my favorite Krusty the Clown quote - "They drove a dump truck full of money up to my front door! I'm not made of stone!"). Like almost all BBM box sets, this one has x number of cards in it where x-1 cards are in the base set and the other card is a "special" card - parallel, autograph or memorabilia. In this particular case, x = 35 and I'm not sure what "special" cards were available. As usual, I got an opened set. 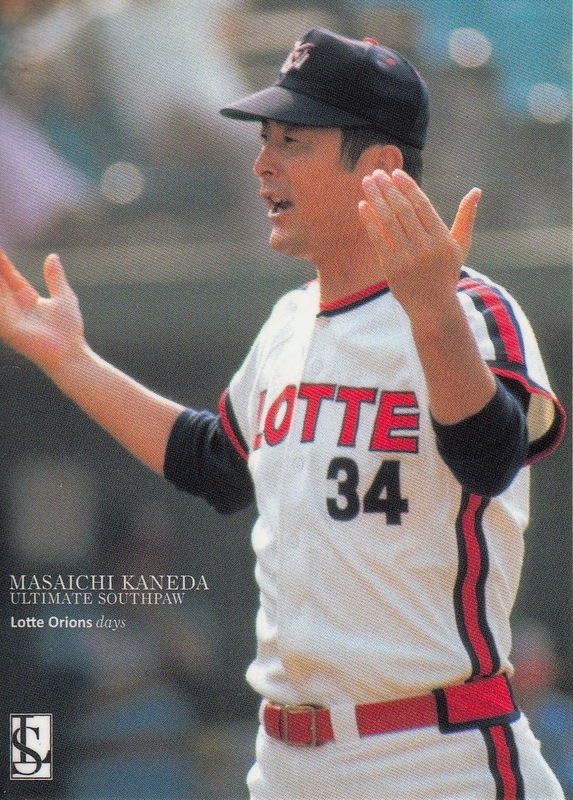 Having 34 cards in the base set works out well as 34 was the number that Kaneda wore during his career (including his two stints as Lotte Orion manager). 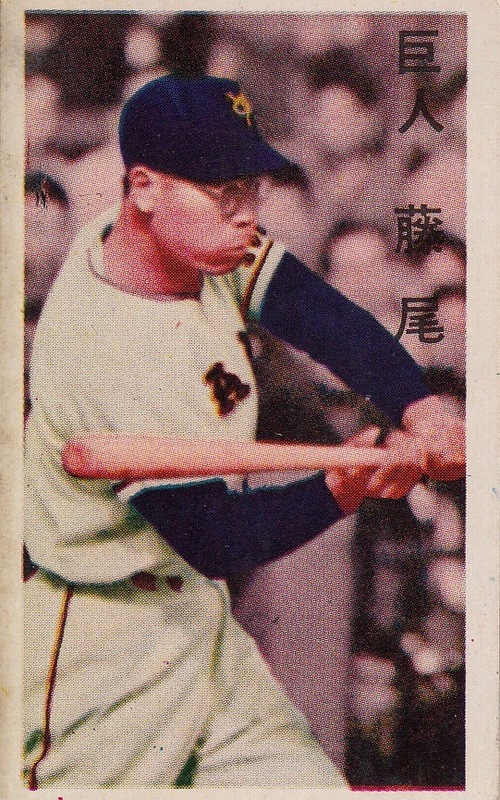 The first 19 cards in the set cover his days with the Kokutetsu Swallows from 1950 to 1964. This includes a couple cards of him in street clothes. Unlike some of BBM's other biographical sets, there are no childhood pictures of Kaneda in the set. 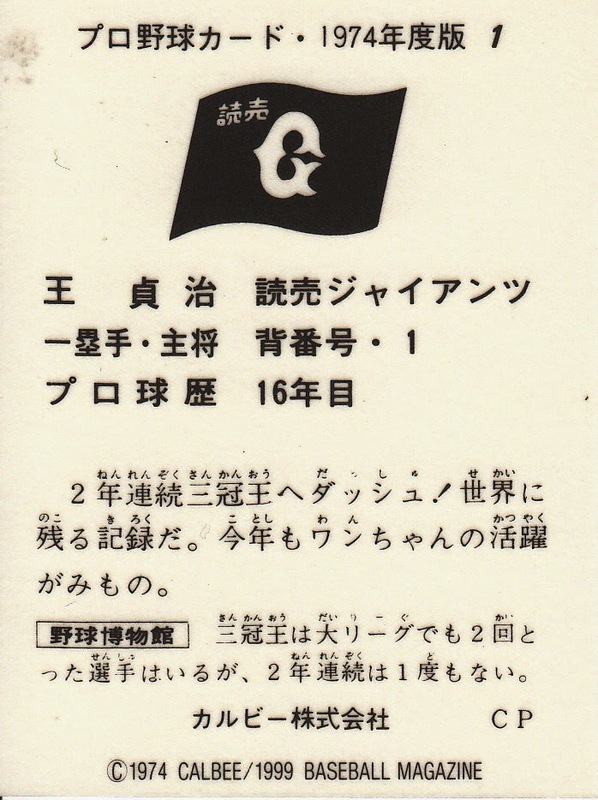 Card #08 commemorates Shigeo Nagashima's first professional game, where Kaneda struck him out four times. 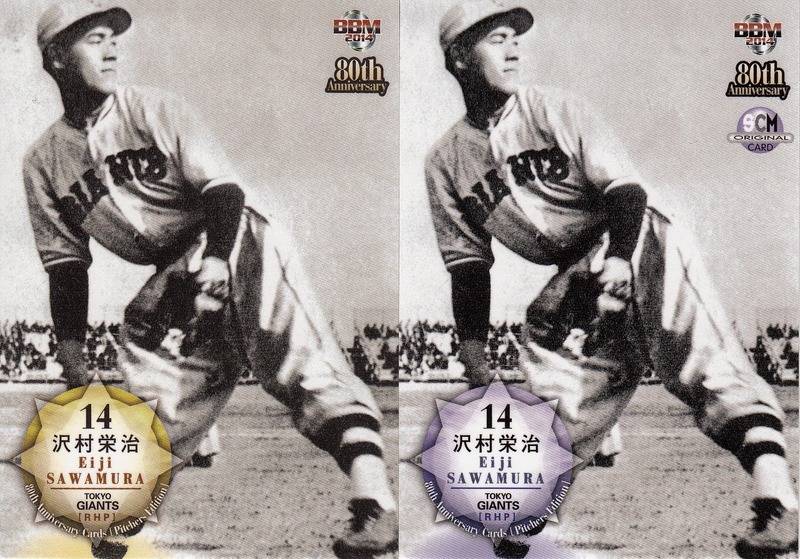 Two of the other cards celebrate the two no-hitters he pitched for the Swallows. Four of the remaining five cards deal with his days as Lotte Orions manager during the 1970's (nothing for his return in 1990 and 1991). The fifth card is for his Hall Of Fame induction in 1988, which I used for Card Of The Week a few months back. Card #30 is the only color card in the entire set. 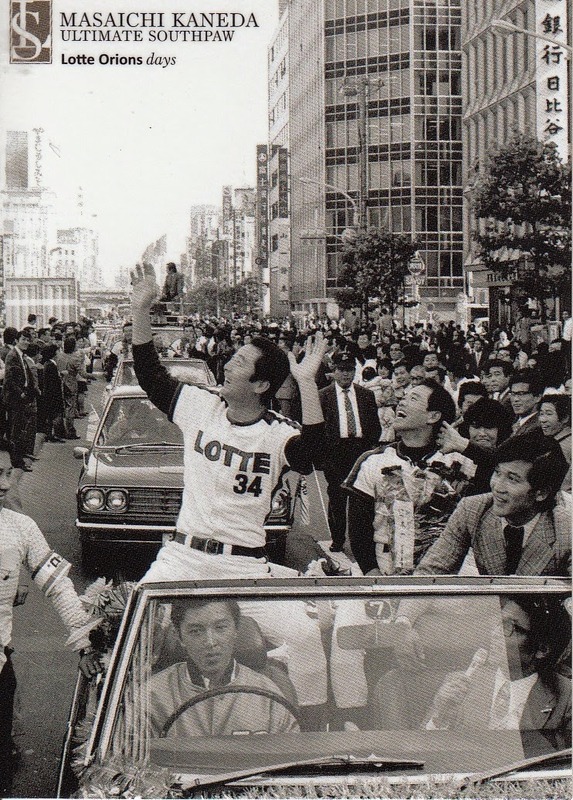 Card #34 shows the victory parade in downtown Sendai for Lotte's championship in 1974. You can see all the cards here. I really like the photography in the set and the cards have a very clean, unobtrusive design. 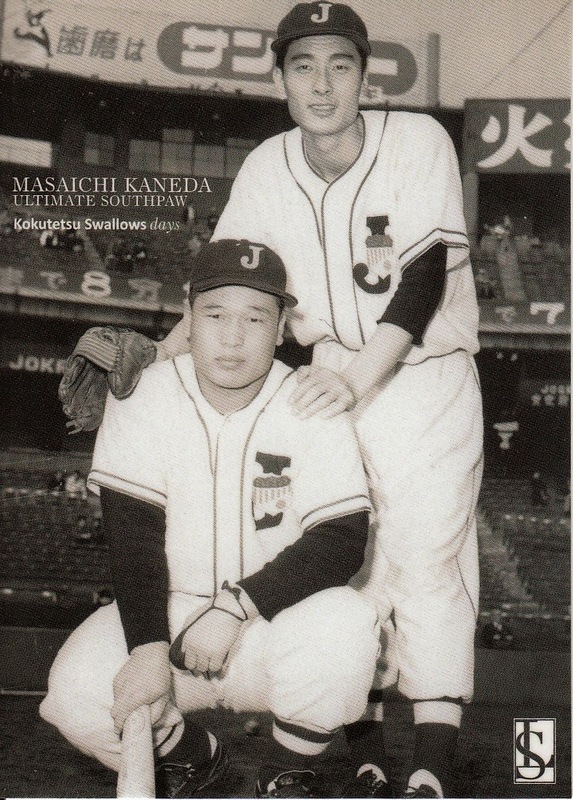 One card in the Kokutetsu cards kind of stands out - this one showing Kaneda and another player wearing Japan National Team uniforms. I don't know for sure what this is from - the History Of Uniform indicates that the uniforms were worn in 1951, 1953 and 1956. I think this picture is from 1956. I don't know if these were worn during the post season tours by MLB teams. 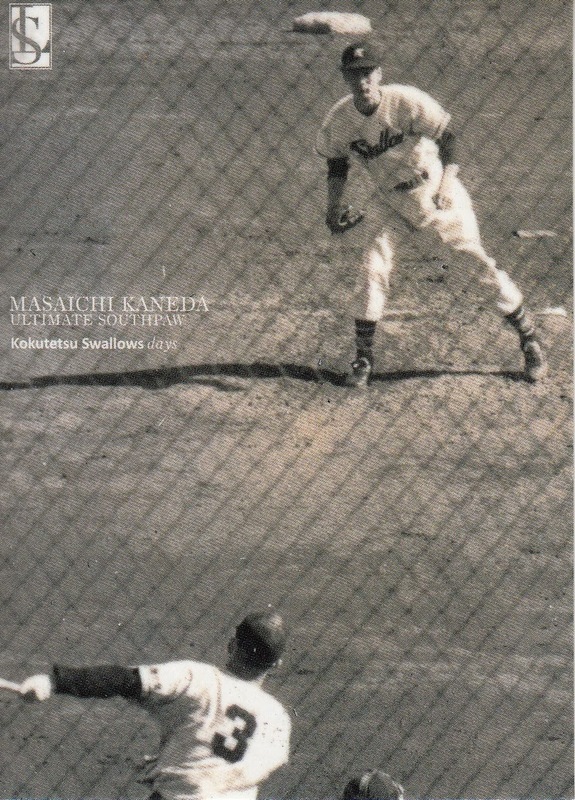 The Dodgers toured Japan in 1956 but none of the pictures I've seen from the tour show these uniforms. I've picked up a number of old menko cards in the last month or so from Ebay. A couple of them I have been unable to identify. Any suggestions anyone has would be helpful. 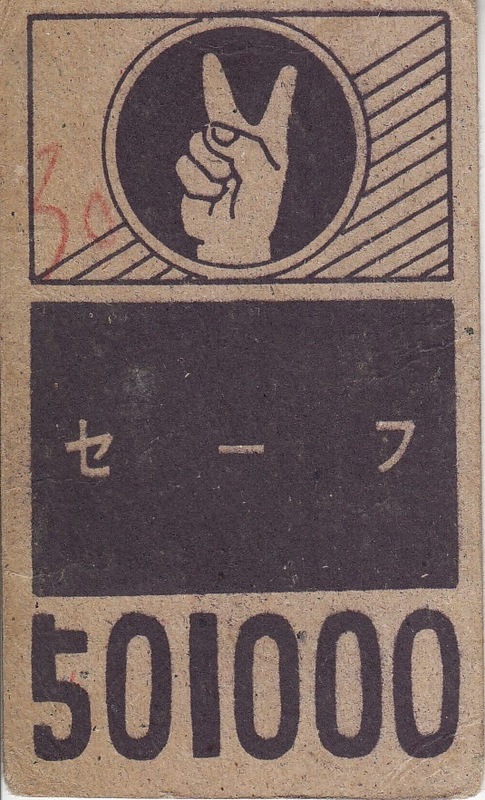 Kagome was a company that produced a number of sets of rectangular menko in the late 1940's and early 1950's, The company had a distinctive logo - a six point star. This Fumio Fujimura card was obviously made from Kagome but the set does not appear in Engel (or at least I haven't found it). 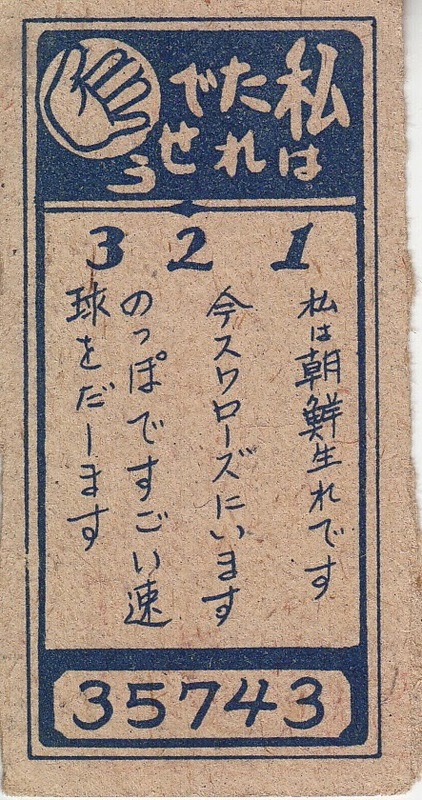 There's a set called Kagome 1 2 3 4 (JCM 52) that is somewhat similar but this card is not from that set. This Masaichi Kaneda card looks very much like a Kagome card but it does not have the logo. 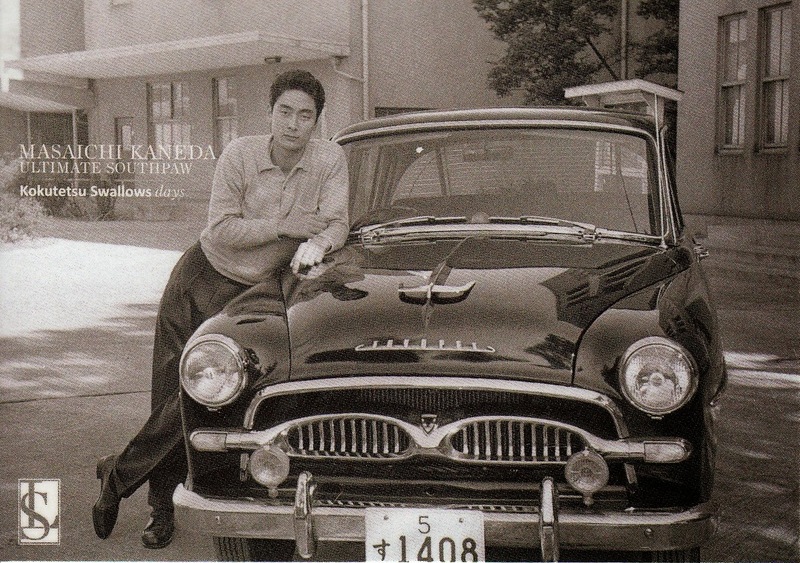 This is potentially a very early card of Kaneda, perhaps from his rookie year of 1950. 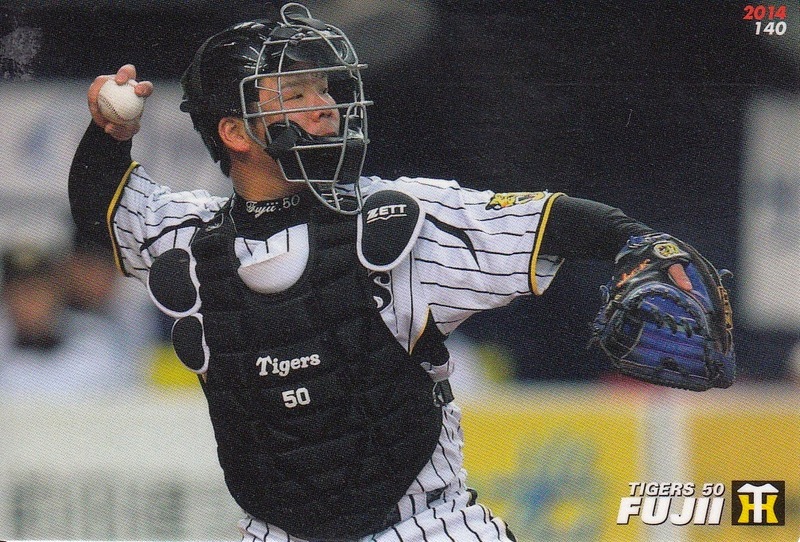 I think this card of Atsushi Otsu of the Tigers is from the same menko set as the "action" cards I wrote about last fall. It would be from around 1957. 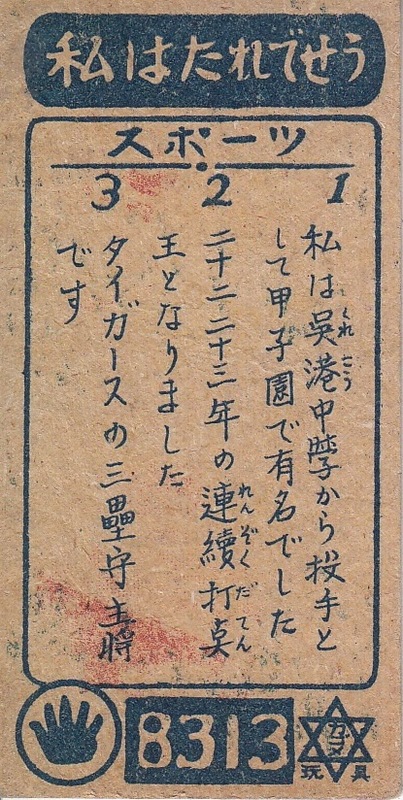 Marusan cards are among the more common menko cards. They were produced between 1957 and 1964. A couple of the sets were imported to the US by Mel Bailey and Bud Ackerman in the early to mid 1960s. 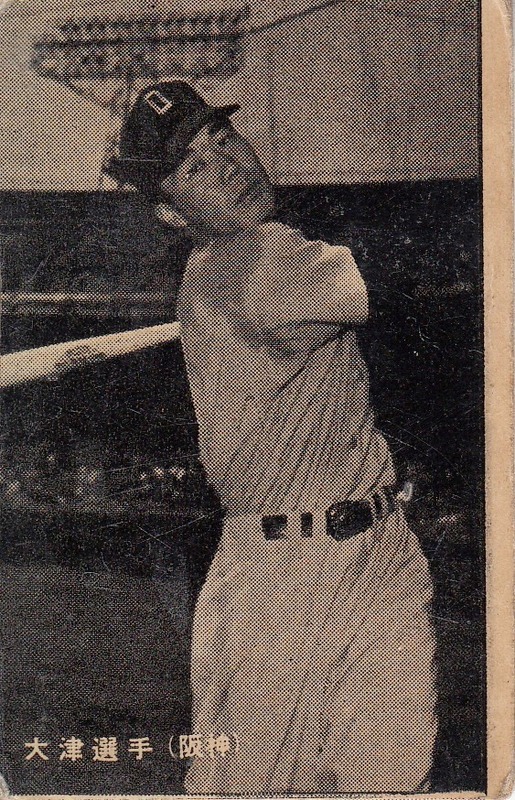 Given that the sets are pretty well known, I was surprised to discover that I could not place this Shigeo Nagashima card. I suspect that it is from one of the JCM 12a-e sets from around 1961 and 1962 but that's really nothing more than a gut feeling. 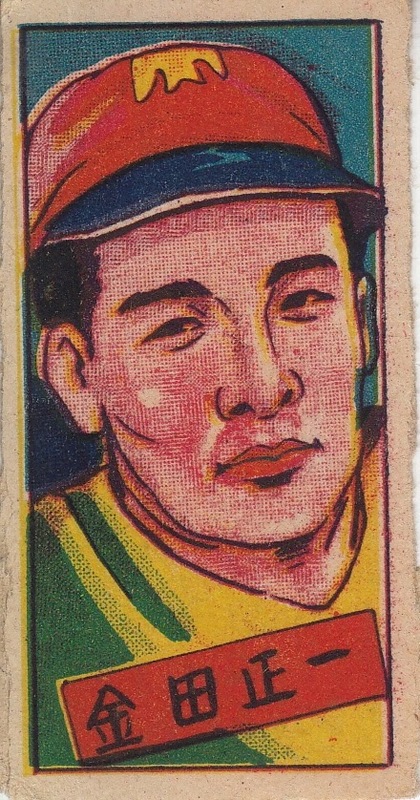 The last card is of Shigeru Fujio of the Giants. 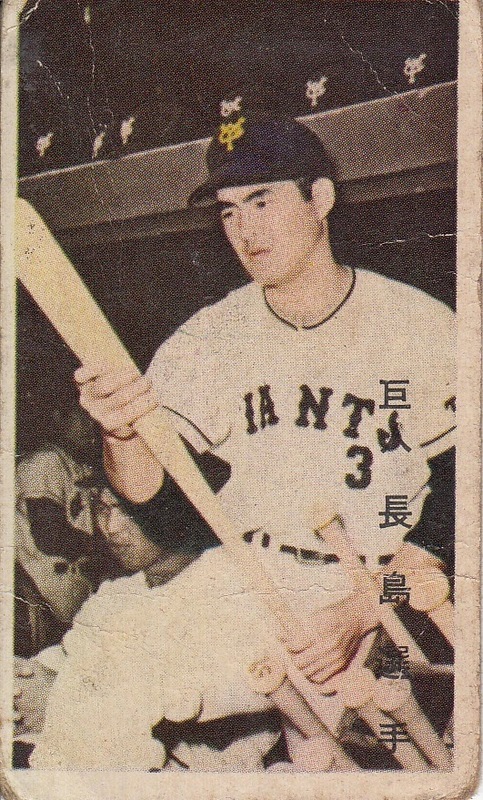 It's clearly a Marukami "Bat On Right" card from the JCM 14a-g sets from 1959-64. Based on the size of the text and the location of the team name (and the fact that it's not in parentheses), it looks to me that it's from the 1961 JCM 14d set but it is not listed. That particular set is the rarest of the "Bat On Right" sets - a couple of the later sets are perhaps the most commonly seen menko cards. If anyone has any ideas about these cards or can point out to me where I missed them in Engel, please let me know. I don't know if it was by design, but the pack was all Pacific league and very heavy on Orix and Rakuten. I'm curious how this pack was distributed. Obviously the packs distributed with the chip bags only have 1-3 cards in them (depending on the year) and have never been transparent. What are these from? Hello, I just bought myself my first box of BBM cards. 2013 BBM 2nd Version to be specific. ... I had a newbie question I was wondering you could help me with... Maybe I got a bad batch but it seems like every now and then I see a card or two with a streak/scuff mark that I assume is from when the cards were printed or packaged. Do you have any advice/tips for either removing them or dealing with them? I'd appreciate any input. I haven't bought much unopened BBM material in years so I don't have much experience with the problem he's talking about. Has anyone else run into this? Does anyone have any suggestions? Lately Calbee's sets are all very similar to each other. This is not necessarily a bad thing, it just limits the amount of interesting things I can say about them. I really like the way that the orange jumps out on Abe's card. One minor complaint I have with the set is that 20 of the players appeared in Series One as well -Shunichi Nemoto, Yudai Ohno, Yuya Hasegawa, Yuichi Honda, Takahiro Arai, Shintaro Fujinami, Takashi Toritani, Kenta Maeda, Eishin Soyogi, Masaru Takeda, Yoshihisa Hirano, Yoshio Itoi, Takeya Nakamura, Ginji Akaminai, Takashi Saitoh, Motohiro Shima, Yasuhiro Ogawa, Sho Aranami, Daisuke Miura, and Hayato Sakamoto. Just seems kind of odd to have almost a quarter of the Second Series repeat players in the First Series. As always you can see all the cards (plus the Star inserts, the "Special Box Limited Edition" AVG Leader cards and the mail-in Lucky cards over at Jambalaya. Ryan did a post on the set a while back as well. 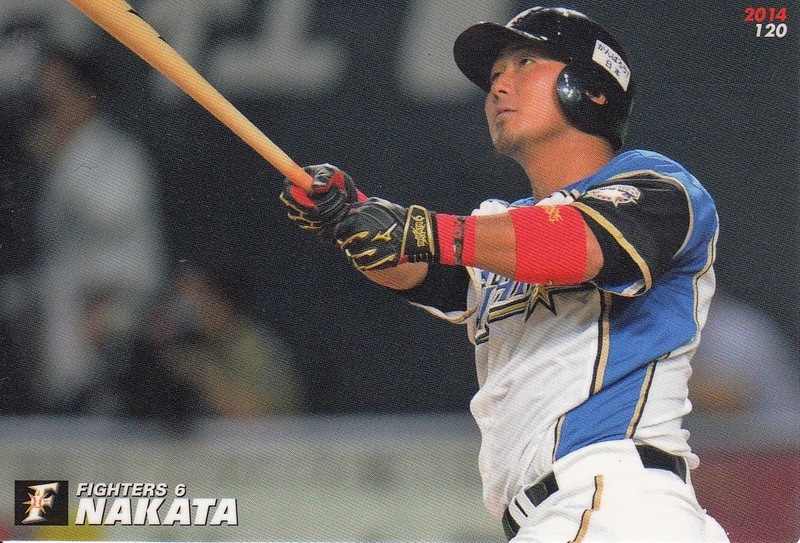 251 of Murata's home runs came when he was a member of the Yokahama Baystars between 2003 and 2011. 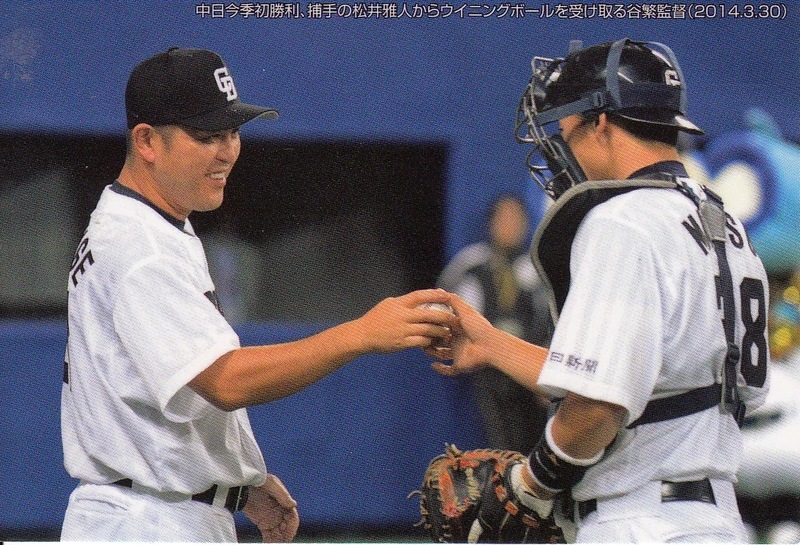 I always mentally pair up Murata and Seichi Uchikawa as the two of them were the main offensive threats in the Baystars lineup through much of the late 00's. 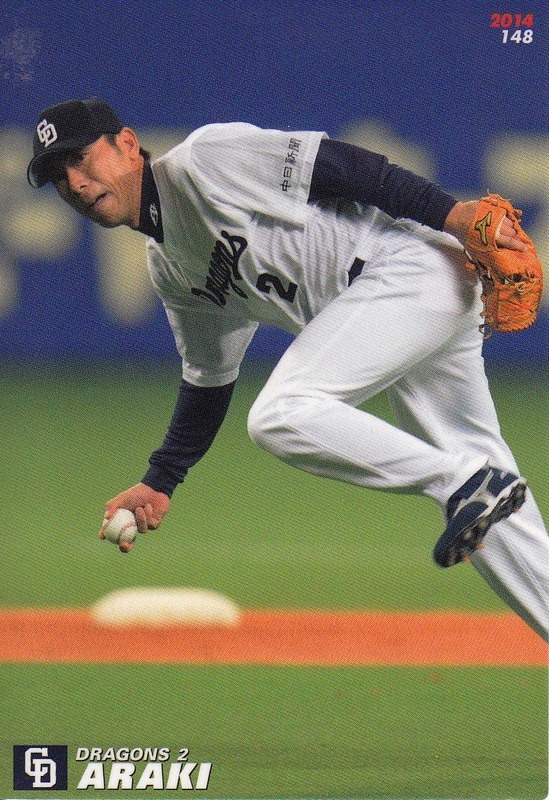 Uchikawa left as a free agent before the 2011 season and won a Nippon Series championship that year with Softbank. 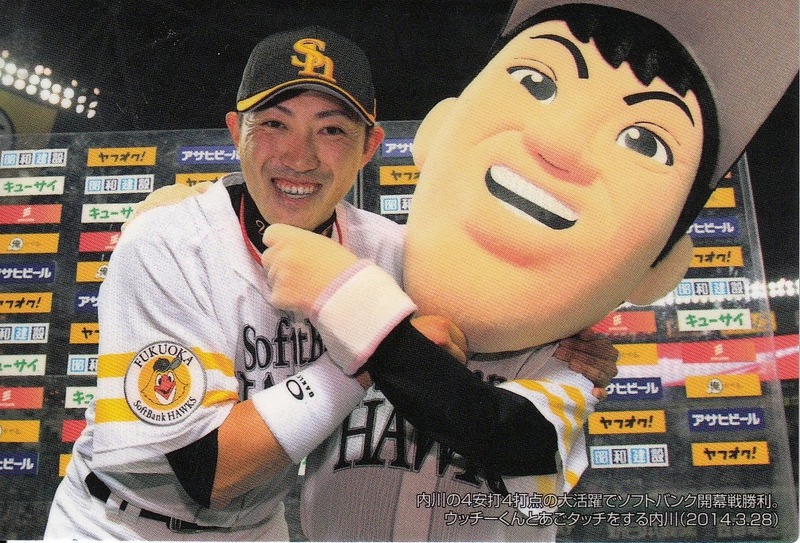 Murata left a year later and immediately won the Nippon Series with the Giants. 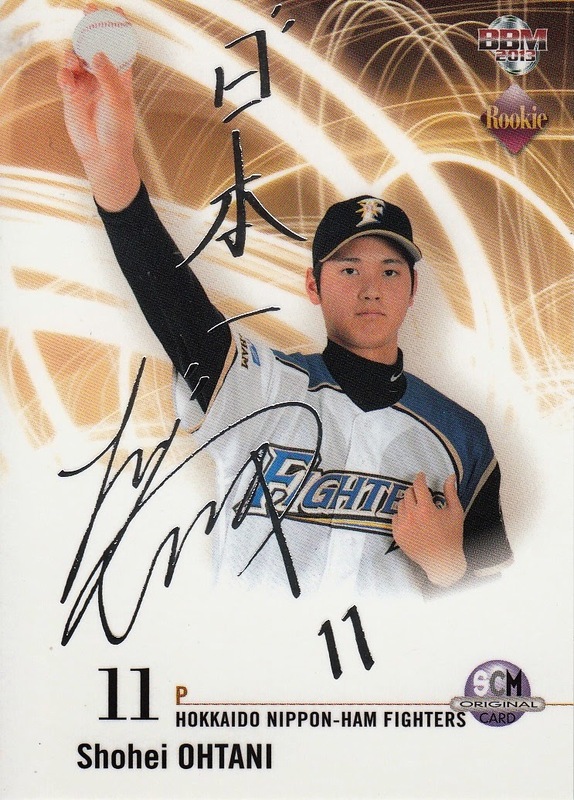 Here's an insert card of Murata from the 2004 BBM Baystars team set (#BN5) . The insert set was called "Baystars Nine" and it paired each member of the set with one of the "traditional" nine planets - Mercury, Venus, Earth, etc including Pluto. 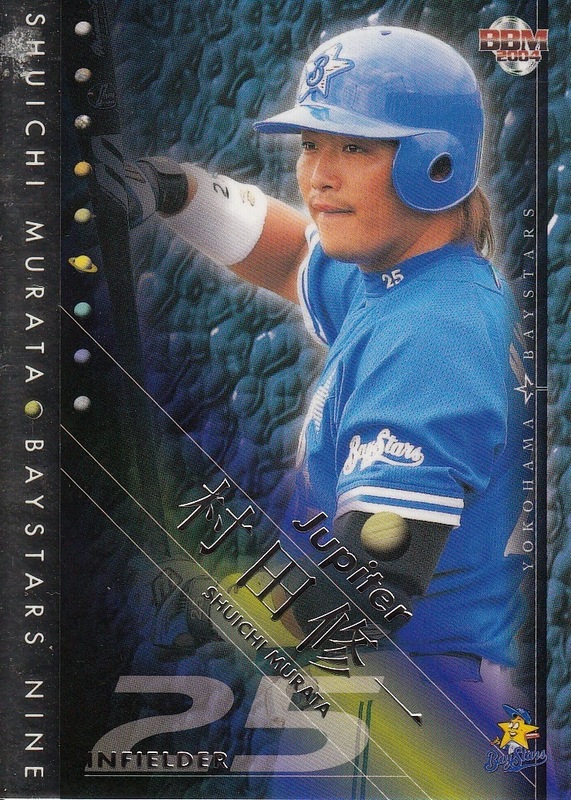 Murata (obviously) was paired with Jupiter. Assuming the other cards are paired in number order to the planets, Kazuhiro Sasaki was Mercury, Ryoji Aikwa was Venus, Tyrone Woods was Earth, Uchikawa was Mars, Takuro Ishii was Saturn, Tatsuhiko Kinjoh was Uranus, Takanori Suzuki was Neptune and Hitoshi Tamura was Pluto. The only card I have from this set other than Murata is Suzuki so that's the only other pairing I know for sure. - The aforementioned Dragons team set will be out in mid-August (Niki says August 21). It's a pack based set with 90 cards in the base set. Now I'm going by the print ad in SCM to determine what the names of the subsets are and (of course) they're all in Japanese (as opposed to the Giants team set where all the subsets are titled in English in the print ad), so I'm going to attempt to make a guess based on the sample cards in the ad. There are 77 cards for the players, coaches and manager, four cards for "Fresh, Local Stars", three cards for veterans(?) and three three card "sequential card series". There's a nine card insert set that I have absolutely no idea what the theme is and some number of autographed cards available. UPDATE - BBM finally put something up on their website for the set. - I've been kind of expecting that at some point this year BBM's going to do an 80th Anniversary set for the Giants. Maybe they still will, but I was kind of surprised to see that Front Runner is putting out a Giants Stars And Legends box set. This is a 32 card set with 30 base cards plus one serially numbered insert card and one autographed card. The 30 base cards are split between 12 cards of active players (including manager Tatsunori Hara) and 18 cards of OB players. 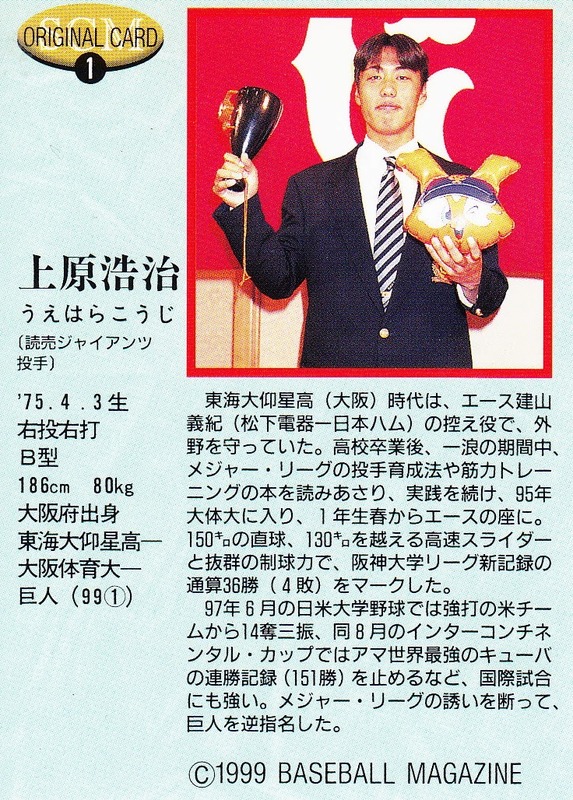 Unlike the Carp Stars and Legends set Front Runner did last year, it looks like Front Runner got most if not all the biggest OB names - Shigeo Nagashima, Sadaharu Oh, Isao Harimoto, Isao Shibata, Suguru Egawa and Masumi Kuwata. Front Runner appears to be marketing this as an 80th Anniversary set but I'm still hoping BBM does a larger set before the end of the year. This set will be released sometime in August. 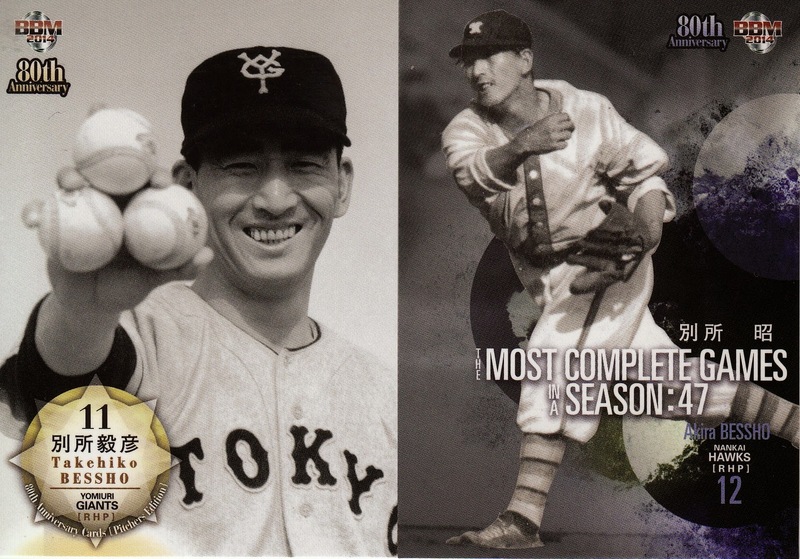 NPB is celebrating 80 years of professional baseball in Japan this season and BBM is issuing two separate historic sets as part of the celebration. The first set, called 80th Anniversary Pitchers Edition, came out back in May. To restate the obvious, the set is devoted entirely to pitchers. The base set contains 99 cards. 90 of these are "regular" player cards. Unlike most of BBM's other OB sets, this one has a decent representation of players from all eras, rather than just the 1970's and later. 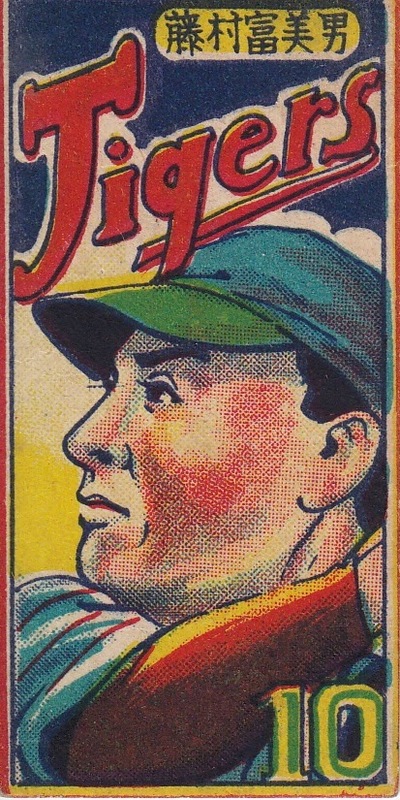 Most of the major pitching names in history are included in the set, including Eiji Sawamura, Victor Starffin, Masaichi Kaneda, Kazuhisa Inao, Keishi Suzuki, Minoru Murayama, Shigeru Sugishita, Yoshio Sotokoba, Hisashi Yamada, Kimiyasu Kudoh and Masumi Kuwata highlight the retired players. 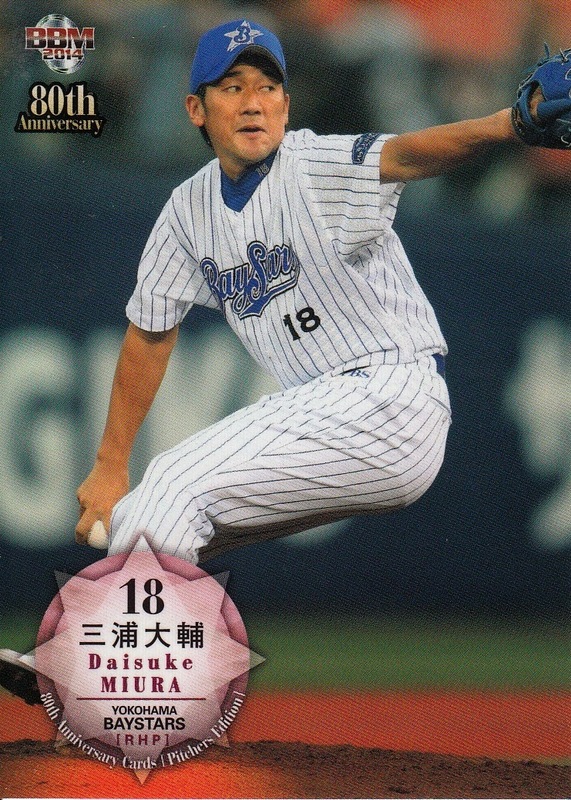 Active players are also included in the set including both NPB players (Masahiro Yamamoto, Kenta Maeda) and MLB players (Yu Darvish, Masahiro Tanaka, Hisaashi Iwakuma, Koji Uehara). Players appear to have been selected because of their performance over their career as well as dominance over short periods of time (Hiroshi Gondoh, Marc Kroon). Foreign players in the set (in addtion to Kroon) include Joe Stanka, Gene Bacque and Taigen and Genji Kaku (who I don't think are related to each other). There are a couple players who don't often show up in the OB sets who appear in this one. This is only the fourth OB set Masaichi Kaneda has appeared in in the last 10 years (in contrast it's at least the ninth BBM OB set Kazuhisa Inao has appeared in over the same period of time). This is the first OB set that Yu Darvish has appeared in and the first NPB set of any type he's been in since he left for MLB prior to the 2012 season. There are a couple notable omissions. 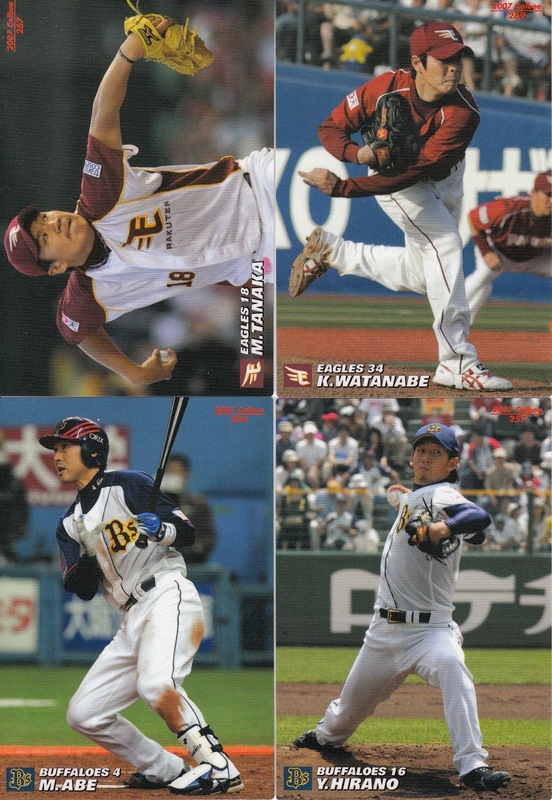 Hideo Nomo and Choji Murata should be in the set but Nomo hasn't been in an NPB set in 20 years and Murata almost never shows up in an OB set (only one BBM set in the last 10 years). 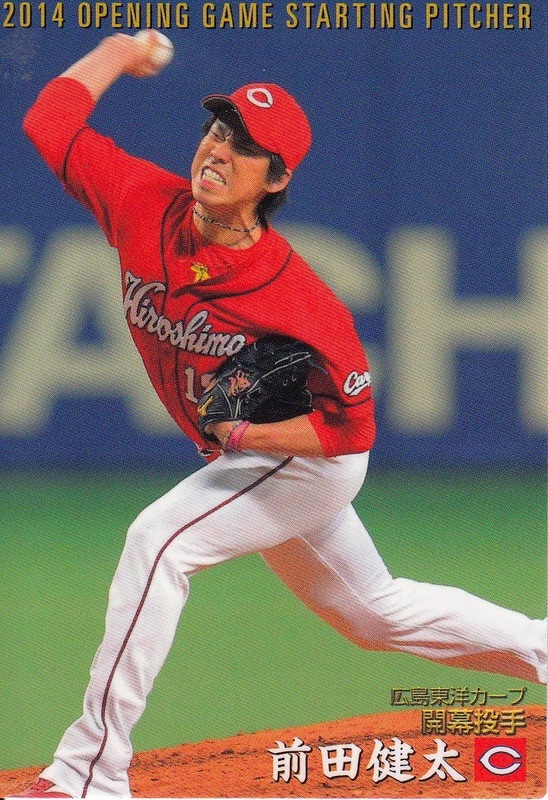 The most surprising omission is Yutaka Enatsu who if nothing else was one of the most interesting pitchers in NPB history. And Enatsu appears in OB sets with some frequency (although he was also a surprising no show in last year's Hawks 75th Anniversary set). The other 9 cards in the set are for single season and career pitching records. 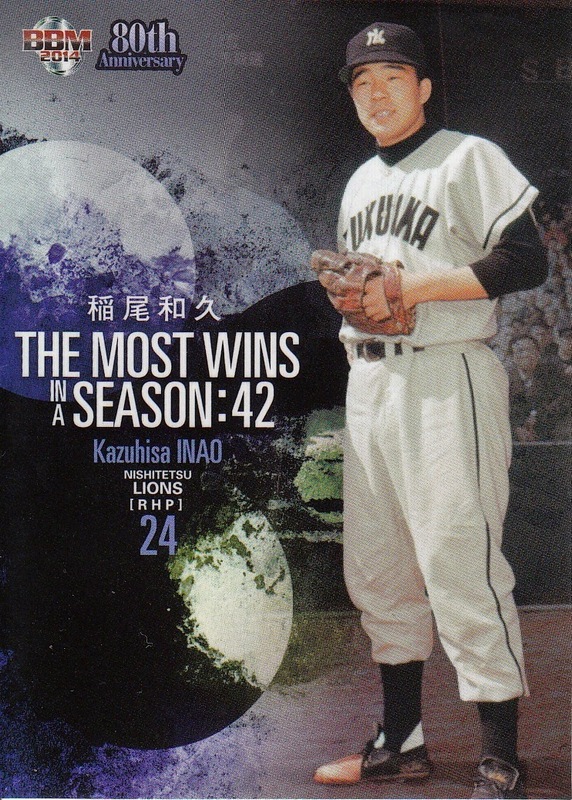 The players included are Akira (Takehiko) Bessho (Most Complete Games in a Season), Hideo Fujimoto (Best ERA), Kazuhisa Inao (Most Wins In A Season), Hitoki Iwase (Most Saves), Masaichi Kaneda (Most Wins), Victor Starfin (Most Wins In A Season), Keishi Suzuki (Most Complete Games w/o BB & HBP), Masahiro Tanaka (Highest Winning % in a Season), and Tetsuya Yoneda (Most Games Pitched). And that's not a typo - Inao and Starffin are tied for most wins in a single season with 42. For the most part, I really like the set. I like a lot of the photographs used, especially the ones of players from the 1950's and 1960's. And as I mentioned above, I really like the player selection in the set. Ryan did a write up of this set back when it came out and you can see all the cards at Jambalaya.